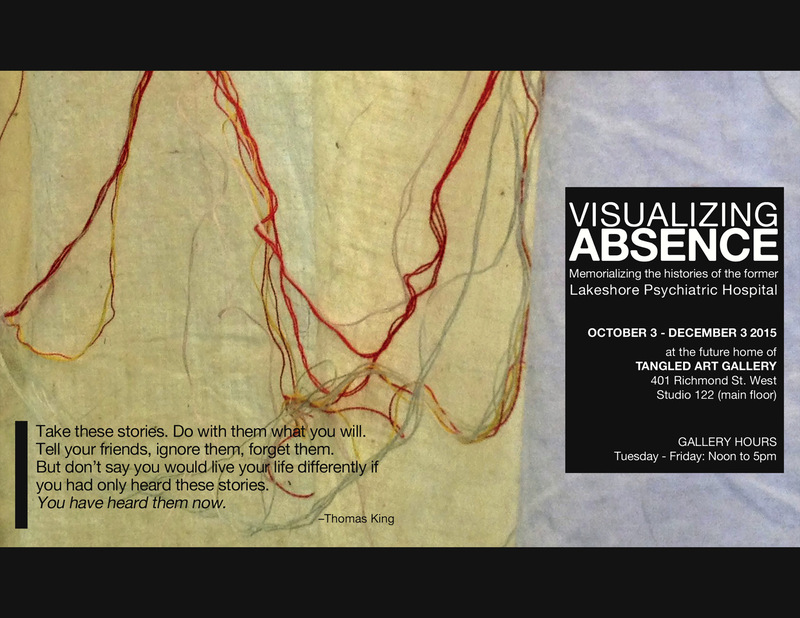 Visualizing Absence: Memorializing the histories of the former Lakeshore Psychiatric Hospital is a collaborative art response to archival images, patient records, and hidden and lost stories and memories that constitute the historic Lakeshore grounds. Artists Alison Brenzil, Dave Clark, Stas Guzar, Susan Mentis, Lucy Pauker and Hannah Zbitnew, in collaboration with Anne Zbitnew, use a variety of media to publicly recover untold, hidden and forgotten histories. We respect the past by recognizing the Lakeshore grounds as Aboriginal land, and by remembering the psychiatric patients who built, lived, worked and died there. This exhibit follows Dr. Geoffery Reaume and other mad scholars, historians, activists, artists and allies who tell stories in a historical context from psychiatric patients’ perspectives. Take these stories. Do with them what you will. Tell your friends, ignore them, forget them. But don’t say you would live your life differently if you had only heard these stories. You have heard them now. There will be difficult but important themes of institutional life, including institutional violence and abuse, discussed and represented at this event. The future home of the Tangled Art Gallery is located at 401 Richmond St. West, studio 122 on the main floor. The closest accessible subway station is at Union Station. The gallery is also accessible by the Spadina streetcar (Queen Street stop going south from Spadina Station, Richmond Street stop going north from Union Station), which is intermittently accessible. This event is in a barrier-free location. There is an accessible washroom on the 4th floor of 401 Richmond. We will have ASL interpretation and supportive listening. We request that you help us to make this a scent-free environment. The exhibit follows Smithsonian Museum guidelines for accessibility and inclusivity. Audio description of the artwork is available. Most of the artwork can be touched. The labels are in a large font and in plain language. The labels include a line drawing of the artwork. For any other accessibility arrangements or questions about accessibility, please contact Anne Zbitnew at visualizingabsence@gmail.com. This is a child-friendly event and a sober space.